24 year old Gunner Ernest Harris served in ‘M’ Battery, 3rd Field Regiment, Royal Horse Artillery, which was part of 7th Armoured Division, the famous ‘Desert Rats’. He was a professional soldier who had been in Palestine at the outbreak of the Second World War. He had also served in North Africa, where he was Mentioned in Despatches for his gallantry. Gunner Harris landed in Normandy just after D-Day alongside the rest of the Division and served right through to the end of the Battle of Normandy. 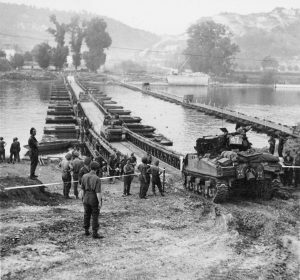 Gunner Harris was killed on 30th August 1944, right at the end of the Battle of Normandy, when his unit was preparing to cross the River Seine in pursuit of the retreating German forces. 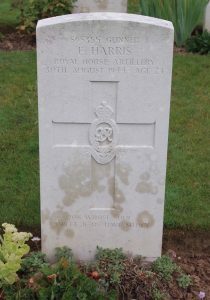 Gunner Ernest Harris is buried at St Desir War Cemetery, where many of the graves belong to those who were killed in the closing days of the campaign. Soon Gunner Harris’ name will also be added to the British Normandy Memorial.